Munich High End Show 6 May 2010. Neat Acoustics announces their first new Ultimatum model in eight years. The Ultimatum XL6 will be available in September 2010. The ULTIMATUM XL6 is a multi-chamber, multi-facet loudspeaker system incorporating six drive units per enclosure. The visible drive units are mounted on sub-baffles, attached to the main enclosure via a polyethylene damping membrane. 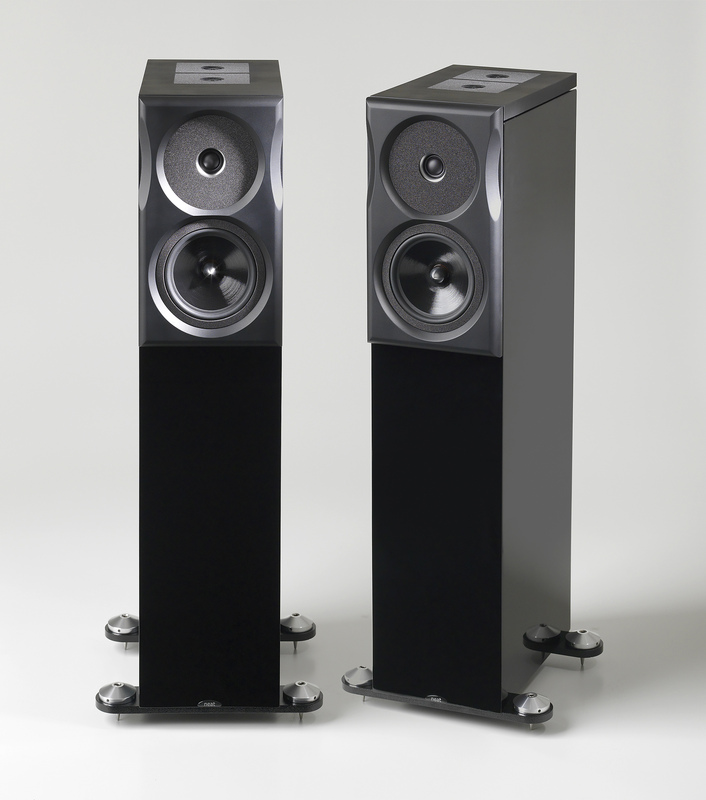 The ULTIMATUM XL6 loudspeaker is floorstanding design which adheres to all the principles that have marked out the ULTIMATUM project and given it such enduring success. The ultra-rigid birch-plywood enclosure, innovative baffle-decoupling technology, isobaric bass loading and use of twin EMIT ribbon-type super-tweeters are employed here to deliver the ULTIMATUM promise of a lifetime of musical enjoyment. The enclosure comprises five discrete internal volumes each optimised for purpose. The Bass and Mid/Bass volumes are large to suit the low frequency tuning while the HF cabinet is small to increase rigidity and to stop back pressure from the Mid/Bass driver adversely affecting the rear chamber of the tweeter. The two EMIT supertweeters are similarly isolated. The main structure is damped 18mm Birch Plywood sourced from slow-growing forests. The drive unit baffles are constructed from a 45mm thick sandwich of Birch Plywood, polyethylene damping membrane and MDF. This provides a rigid non-resonant platform, which is ideal for optimal performance of the drive units. The two hidden isobarically loaded Neat 168mm bass drivers are flux optimised for purpose and use dustcaps for rigidity. The main Mid/Bass driver is a special version of the Neat 168mm driver with an aluminium phase plug to aid dispersion and reduce dynamic compression. Its enclosure is loaded by a low Q reflex tuning. A sealed sub-volume contains the main HF drive unit a modified SEAS XL SONOMEX domed XL unit with additional damping and support. A separate sub-volume contains two EMIT type supertweeter drive units. These fire upwards operate quietly and add a sense of space and realism to the performance. Two bass-only drive units are located at the bottom of the cabinet, in isobaric configuration, with one unit on the bottom panel facing downward. Acting as a passive subwoofer, these units are linked together and both receive the same signal, in phase. There is a sealed volume in between the two units, and the main enclosure is reflex-tuned. The crossover is a minimalist five element type (plus damping & attenuating resistors) employing precise-tolerance, low-loss air-cored inductors and high tolerance polypropylene film & foil capacitors. The speaker exploits predominantly first-order crossover slopes and mechanical roll-offs for a natural, uninhibited performance. Enclosure type: Multi-chamber, multi-driver array, incorporating isobaric internal cavity, plus upward firing super-tweeters. Recommended amplifier power: 25 – 200 watts. Impedance: 8 ohms average. Minimum 5 ohms.